The designation of Christ, by Isaiah, to His office as Mediator (v. 1-3). The assurance given him of the success of His undertaking among the Gentiles (v. 4-8). The redemption that would be earned by Him, and the progress of that redemption (v. 9-12). The encouragement given then to the afflicted church (v. 13-17). Many Israelites lived abroad. But here the reference is to foreign nations, rather than to Israelites. Isaiah repeats the command to listen. This is to emphasise that the message is for foreigners. In the Bible, ‘call’ is a technical word. It means to appoint to a task. Isaiah’s ‘call’ came before he was even born. (See Jeremiah 1:4-5 for a similar thought). Using words like ‘sword’ and ‘arrow’ show that Isaiah’s message from God will have a powerful effect on people’s lives. 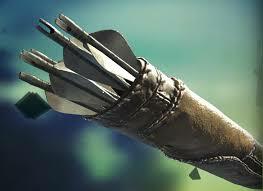 Like a sword or an arrow, Isaiah’s words will be sharp (clear, sudden and powerful). The mere ‘shadow’ of a hand may seem strange ‘protection’. But with God, even His shadow is always sufficient (see Psalm 17:8). The shadow reminds God’s people that He is very close to each believer. When God originally called Isaiah to speak for him, he had warned Isaiah about people’s reaction. People would not listen to Isaiah (see Isaiah 6:9-12). But Isaiah wisely realized that his own duty was to obey God. What happened when others did not listen would not be Isaiah’s responsibility (see Isaiah 40:4-8). It was God’s responsibility. In verse 5, the first words are similar to those in Isaiah 43:1 and 49:1. But here Isaiah adds that the Lord provides him with the necessary help. The Lord has an even greater task for Isaiah. He is to tell all nations that the Lord can rescue every person from the result of an evil life. Much of what appears here will appear again in the 4th Servant Song (see Isaiah 52:13 to 53:12). There is a double meaning of ‘Servant’ in this verse. The name refers to the experience of the nation called Israel. But it also refers to the experience of Messiah. When Israel failed to carry out the Lord’s purpose, the Messiah did so instead of Israel. Isaiah’s encounter with God changed him. From what he tells us, how can we tell if we have had an encounter with our God? What would constitute God’s shadow in today’s world? How successful were the Israelites in living up to their end of the covenant with God? Why does this make Christ so important to the world? The glorious rising of the morning-star—John the Baptist (v. 1). The doctrine he preached (v. 2). The fulfilling of the scripture in him (v. 3). How John lived (v. 4). How the multitudes came to him, and their submission to his baptism (v. 5, v. 6). His sermon that he preached to the Pharisees and Sadducees, wherein he endeavours to bring them to repentance (v. 7-10), and so to bring them to Christ (v. 11, v. 12). Immediately after, we have the honor done by Christ to the baptism of John (v. 13-15). The honor done to Christ by the descent of the Spirit upon Christ, and a voice from heaven (v. 16, v. 17). Matthew does not tell us exactly when John began his work. But Luke tells us the names of all the rulers at that time (Luke 3:1-2). It was about 30 years after Jesus was born. Judea’s wild country was the desert area on the west side of the Dead Sea. John may have stayed in the desert with the Essenes. They were a group of Jews who lived a very strict life together. They lived at Qumran, which was by the Dead Sea. Nobody had given the people a message from God for about four hundred years. Then John suddenly arrived in the desert. John said that people must turn from their sins. They must prepare themselves for God to rule as he does in heaven. The Jews greatly respected God and his name. They would not use God’s name. Instead, they used the word ‘heaven’. God rules in heaven. But now God wants to rule in a person’s life. It is not a political idea. People should obey Jesus the king. Then they can become citizens of where God rules. John made Isaiah’s words (Isaiah 40:3) come true. All four gospels agree with that. In those days, people had to repair a road before a king travelled on it. John was like someone who gave orders to the people. He described himself as ‘a voice that is calling out in the desert’ (John 1:23). He was telling people to prepare for the Messiah. John had made rough clothes from camel’s hair. They were like the clothes that God’s servant Elijah wore long ago (2 Kings 1:8). The Jews believed that Elijah would return. Then he would announce that the Messiah was coming (Malachi 4:5). Even John’s food was simple. When people were not Jews wanted to become Jews, they asked for baptism. They did not usually baptize people who were Jews already but John even baptized Jews in water. They had confessed their sins and they wanted to obey God. Water cleans a person’s body. In a similar way, baptism shows that a person is ‘clean’ from their sins. They would then be ready to meet the Messiah. Verse 7 The Pharisees were Jews who wanted to obey God’s Law. There were many good Pharisees. One was called Gamaliel (Acts 5:33-39). But there were also many proud Pharisees. They believed that they were the only people who obeyed God’s law. But they destroyed what the law really meant. Through the years, the official writers (called ‘scribes’) had introduced hundreds of extra rules. The Pharisees said that people must also obey all those extra rules. The Sadducees came from the families of priests. They were wealthy. They wanted to keep their political power. So they opposed any religious ideas that might make them lose their authority. John called the Pharisees and the Sadducees ‘a family of poisonous snakes’. Later, Jesus used the same words about the Pharisees (Matthew 12:34; 23:33). They were dangerous. They were like poisonous snakes. John said that they were like snakes that were trying to escape from a fire in a forest. He meant that God was angry with them. They were trying to escape from God. A person’s actions show whether they have sincerely changed their way of life. The Jews believed that Abraham’s actions were good enough for himself and for all his children and their families always. So Jews thought that they were safe after they died. But John said that that was not enough. A person may have Abraham as his ancestor but each person must change his own actions. A farmer cuts down trees that do not produce good fruit. He throws them into the fire. God is like a farmer. He will punish those people who do not live in the right way. John knew that he was preparing the way for someone. That person was much greater than he himself was, John said. Only a slave carried other people’s shoes. John said that he was not good enough to do even this humble task for the Messiah. John baptized people with water. This showed that people desired to be free from sin. The Messiah would give the Holy Spirit. The Jews had looked forward to the time when the Spirit would come. ‘It shall happen that I will pour out my Spirit on everyone’, God’s servant had said long ago (Joel 2:28). The Spirit teaches people how to live in the true way. The Spirit also gives people the power to live in the right way. Fire is very powerful. Fire can also destroy. Therefore, it is picture language for God’s judgement. In describing grain at harvest time, John showed that the Messiah would separate people. The people who believed him would be like the grain. They would be his people. But some people did not accept the Messiah. They were like the part of the plant that the farmer burned. God would judge them. Jesus came from Galilee to the river Jordan. He wanted John to baptize him. v14 But John tried to refuse. ‘I need you to baptize me’, John said to Jesus. ‘So why do you come to me?’ v15 Jesus replied to him. ‘Let it be this way now’, Jesus said. ‘It is right for us to do this. It carries out God’s good plan.’ Then John agreed to baptize Jesus. v16 Jesus went up out of the water as soon as John had baptized him. At that moment, heaven opened, and Jesus saw God’s Spirit. The Spirit came down like a gentle bird on Jesus. v17 Then a voice from heaven spoke. ‘This is my son whom I love. I am very pleased with him’, the voice said. Jesus was perfect. He had no sins to confess. Jesus did not need John’s baptism. But he was showing that John’s work was right. Jesus had come to rescue people from their sins. He wanted to show people that he was a real person too. His baptism also showed that he was going to begin his own public work. Only Matthew’s gospel records that John protested. Jesus was greater than John was. So John thought that Jesus ought to baptize him. We end our lesson verses with a gentle bird, a sign of peace. . Jesus would bring peace between people and God. He would also bring peace between different people. The gentle bird was also a sign of a new start. It would remind Matthew’s readers about Genesis 8:8-11. The same kind of gentle bird came back to Noah after the flood. This bird was a sign that Jesus would do his work in a gentle way. It was also a sign of the Holy Spirit. The Spirit gave Jesus the power to do God’s work. The voice from heaven links words from Psalm 2:7 and Isaiah 42:1. Psalm 2 describes God’s ‘son’. He is the king, and all the rulers on earth must serve him. Bible teachers call Isaiah 42 one of the ‘Servant Songs’. God was very pleased with this special Servant and he would have God’s Spirit. This Servant would then be able to do God’s work. The last of the ‘Servant Songs’ was in Isaiah 53. It spoke about a Servant who would suffer and die for other people. Who are the “strange” people in our world that we might compare to John the Baptist? Why do you think the people responded to someone dressed in camel hair, eating bugs? Explain in your own words, what is baptism? What must a person do to be baptized? Why do you think Jesus, who was without sin, insisted on being baptized? What is the role of the church today in keeping the spirit of John the Baptist alive?